Protect Oriole, Hummingbird, fruit, and butterfly feeders from ants Simply hang above the feeder and fill with water - ants can’t swim! Easy to clean concave bowl. Less maintenance than most ant-moats! Extremely strong - Holds even the largest feeders! Comes with "S" hook, fits all nectar feeders - even decorative feeders. Measures: 3.5" wide x 3.5" deep. 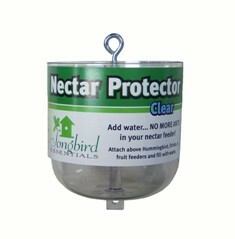 Songbird Essential's Nectar Protector hold 300% more water than the competition.